Audrey Medlock Engles of Batesville passed away peacefully on October 14th, 2017. She was born August 7th, 1928 to the late Walter and MayBell Williams Medlock. Audrey was the youngest of six children. She began her career as an operator with Southwestern Bell Telephone Company in May of 1947. Two years later she transferred to the Commercial Department as a Service Representative. In July of 1978, she transferred to the Plant Department as a test desk technician. With the closing of the test center in Batesville, she transferred back as a Service Representative where she retired from her telephone career in July 1982. During her retirement she also worked for several years as a hostess at Western Sizzlin and enjoyed several trips with her friends. 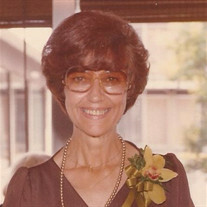 She was a wonderful mother, grandmother, sister, aunt, and beloved family member to many relatives. She also had many Southwestern Bell "family" members. Her beautiful smile, cheerful attitude, friendliness, and the ability to tell a joke or two helped her win the title of Queen of Greenhurst Nursing Center in 2016. She was a loving, caring, and sweet lady to everyone. The very best! We will all miss her very much. She was preceded in death by her husband, John H. Engles, brothers, Paul Medlock, Harold Medlock, and Robert "Bob" Medlock, two sisters, Maudie Medlock and Nadine Farmer, sisters-in-law, Mary Jo Medlock Bowman, Ruby Riesland, Anna Engles, son in law, Mike Whitman, nephew, Robert Medlock, and her wonderful friend, Dale Plaster. She is survived by her daughter, Andra Engles Whitman, grandsons, Michael Whitman and his wife Sarah, and Matthew Whitman and his wife Brittany, great grandchildren, Lexxi, Isaac, and Andie Lynn Whitman, nieces, Donna Medlock Solomon, Lisa Medlock, Regina Bryant and Katrina Fudge, nephews, Kenny Medlock, Kent Farmer, and Greg Medlock, great nephews, Jeremy Solomon and David Rowe, great-great nephew, Gideon Rowe, and a special sister-in-law, Jennie M. Leonard and her husband Jim Leonard. Visitation will be Thursday, October 19th from 5-7 PM and the funeral service will be Friday, October 20th at 2 PM both at the Willis Funeral Service Chapel with Bro. Steve Smith officiating. Burial will follow at the Campground Cemetery of Bethesda. Pallbearers include, Michael Whitman, Gregory Medlock, Jim Leonard, Darrin Plaster, Nick Fudge, and Tommy Bryant. Honorary Pallbearers include, Matthew Whitman, Earl Whitman, David Whitman, Ken Medlock, and Kent Farmer. In lieu of flowers donations may be made in memory of Mrs. Audrey to the American Heart Association or the Bethesda Campground Cemetery Fund. A special thank you to the caring staff at Greenhurst Nursing Center in Charleston, Arkansas.